Simulation Master is an Excel add-in for Monte Carlo simulation . What if you could estimate the probability of your project being profitable? How about knowing your project's schedule risk? You can do it with Simulation Master. Take your spreadsheet models to another level by replacing single point estimates with a more in-depth analysis. You can perform quantitative risk analysis using Simulation Master's powerful features. In addition to risk analysis, Simulation Master is also used for engineering and scientific applications. The broad array of features and it's tight integration with Excel gives you the flexibility to analyze your models all within the Excel environment. 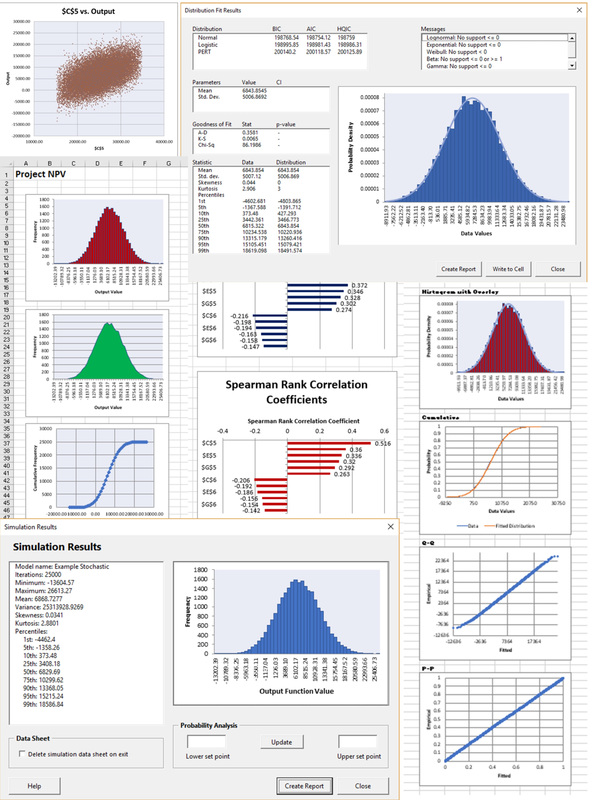 Simulation Master has 21 built-in probability distributions, and the ability to create custom distributions. Also, it can create a wide array of reports. It also features a sensitivity analysis tool. This tool is used to determine critical inputs to the model. There are two versions of Simulation Master to meet your needs, a standard edition and a premium edition. The standard edition is a full Monte Carlo simulation add-in package, and is perfect for the light user. The premium version has all the features of the standard edition. It also has optimization, decision variables, and distribution fitting. 1. Build an Excel spreadsheet model. 2. Determine inputs to the model that are random variables. 3. Determine the distribution, and parameters of each random variable. This may be based on expert estimates such as determining the minimum, most likely, and maximum task times when simulating a project critical path. If historical data is present, Simulation Master Premium's distribution fitting tool can be used to find the best fit distribution and its parameters. 4. Replace single point estimates in the model with Simulation Master's random variable functions. 5. (Optional) If random variable inputs are correlated, create a correlation matrix in the model, or use copulas to structure correlation among variables. 6. Run the simulation. Raw simulation data can be saved in the Excel workbook in a separate worksheet. Output summary statistics. Simulation Master generates summary statistics of the simulation output. These can be included in a summary report placed in the Excel workbook. Histogram, frequency polygon, and cumulative frequency charts of the output can also be included in the summary report. Probability analysis of outcomes. The probability analysis tool determines probability of outcomes above/below a set-point or inside/outside of a range. Correlation of inputs to output. The correlation tool will generate Pearson and Spearman Rank correlation coefficient values for each random variable with output. The tool will also generate tornado charts of the coefficients. This is useful for sensitivity analysis in determining which random variables have the most effect on output. Scatter plots of inputs to output. The scatter plot tool will create scatter plots of random variables vs. output and you can create scatter plots of random variable vs. random variable. 8. Present the results. All charts and reports are native Excel objects so you can easily change formatting to meet your needs. Standard Edition: $199 for single user permanent license. Premium Edition: $299 for single user permanent license. One year of support included. Ongoing support and product maintenance available. Visit the Vortarus Knowledge Base for tutorials, example workbooks, and general information.